Base class defining a sound's properties. 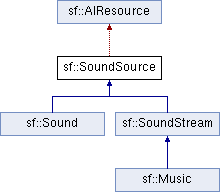 sf::SoundSource is not meant to be used directly, it only serves as a common base for all audio objects that can live in the audio environment. It defines several properties for the sound: pitch, volume, position, attenuation, etc. All of them can be changed at any time with no impact on performances. Definition at line 42 of file SoundSource.hpp. Enumeration of the sound source states. Definition at line 50 of file SoundSource.hpp. This constructor is meant to be called by derived classes only. Get the attenuation factor of the sound. Get the minimum distance of the sound. Get the pitch of the sound. Get the 3D position of the sound in the audio scene. Get the volume of the sound. Tell whether the sound's position is relative to the listener or is absolute. Set the attenuation factor of the sound. The attenuation is a multiplicative factor which makes the sound more or less loud according to its distance from the listener. An attenuation of 0 will produce a non-attenuated sound, i.e. its volume will always be the same whether it is heard from near or from far. On the other hand, an attenuation value such as 100 will make the sound fade out very quickly as it gets further from the listener. The default value of the attenuation is 1. Set the minimum distance of the sound. The "minimum distance" of a sound is the maximum distance at which it is heard at its maximum volume. Further than the minimum distance, it will start to fade out according to its attenuation factor. A value of 0 ("inside the head of the listener") is an invalid value and is forbidden. The default value of the minimum distance is 1. Set the pitch of the sound. The pitch represents the perceived fundamental frequency of a sound; thus you can make a sound more acute or grave by changing its pitch. A side effect of changing the pitch is to modify the playing speed of the sound as well. The default value for the pitch is 1. Set the 3D position of the sound in the audio scene. Only sounds with one channel (mono sounds) can be spatialized. The default position of a sound is (0, 0, 0). Make the sound's position relative to the listener or absolute. Making a sound relative to the listener will ensure that it will always be played the same way regardless of the position of the listener. This can be useful for non-spatialized sounds, sounds that are produced by the listener, or sounds attached to it. The default value is false (position is absolute). Set the volume of the sound. The volume is a value between 0 (mute) and 100 (full volume). The default value for the volume is 100. Definition at line 274 of file SoundSource.hpp.